Pull handles function exactly as they sound. They are any type of hardware handle, such as a drawer handle, that you pull on to move something. Other common names for pull handles include: industrial handles, grip handles, grab handles, pulls, door handles, cabinet handles, tubular handles, tubular grips and handle tubes. The most common are horizontal pull handles, like drawer pulls and car door handles. The term “pull handles” also applies to those handles used for lifting. Cabinet and Electronic Pull Handles – Hardware Mfg. If you’re looking for industrial pull handles, your options are nearly endless; they incorporate as much or as little specialty design as you like. They are primarily offered in stainless steel, brass, aluminum and chrome, but are also available in other materials, like duroplast, nylon plastic and cast iron. The selection of a handle’s material depends mainly on its use and the conditions to which it will be exposed. For example, a pull handle that will be used outdoors will need to be made of a material that is resistant to wear and rust. Such a handle may also require enhanced abrasion resistant, chemical resistant or antimicrobial finishes. Discuss your requirements with your manufacturer to find the right material and finishes for you. Industrial Pull Handles – Hardware Mfg. Further customize pull handles for your purposes with threaded studs, threaded holes, mounting plates and the like. Choose your pull handle style for functionality, aesthetics or both. Options available range from modular to avant-garde styles. Examples include: load rated, through, offset, weld on, folding, recessed folding and European design handles. Custom designed pull handles are quite common as well. No matter your project or application, the selection and design of your pull handles can be an enjoyable experience with the right manufacturer. Look for a partner who wants to share your vision and go the extra mile to ensure your success and satisfaction. Pull Handles Pull handles function exactly as they sound. They are any type of hardware handle, such as a drawer handle, that you pull on to move something. 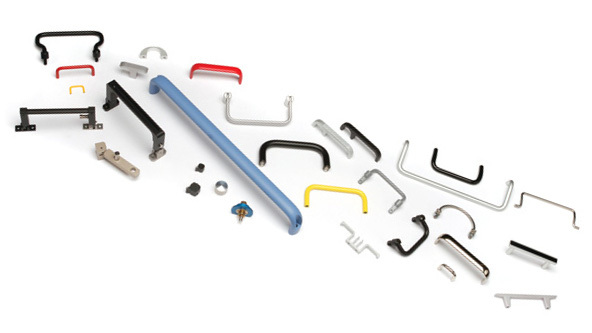 Other common names for pull handles include: industrial handles, grip handles, grab handles, pulls, door handles, cabinet handles, tubular handles, tubular grips and handle tubes. 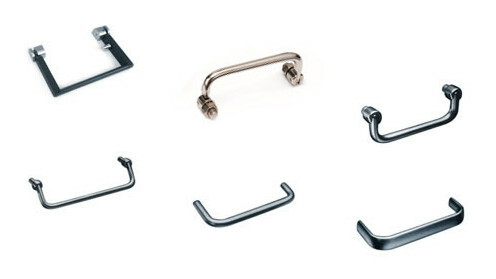 The most common are horizontal pull handles, like drawer pulls and car door handles. The term “pull handles” also applies to those handles used for lifting.